This species may not yert have appeared in the aquarium hobby. 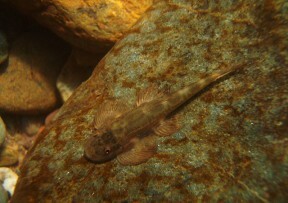 Specimen in its natural habitat, Nan river system, northern Thailand. Dorsal view; specimen in the natural habitat. In Hemimyzon the pelvic fins do not form a sucking disc, unlike in many related genera. 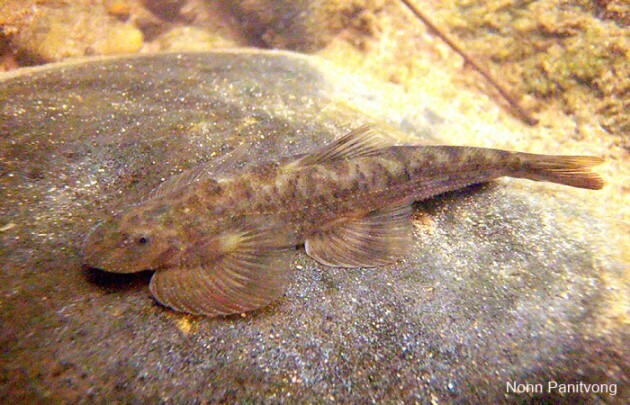 This species can lighten or darken its colour pattern depending on the substrate. Currently H. nanensis is known only from the Nan river basin. Hemimyzon: from the Greek hemisus, meaning ‘one half’, and Greek myzo, meaning ‘to suckle’. nanensis: named for the Mae Nam Nan river basin, type locality of this species. 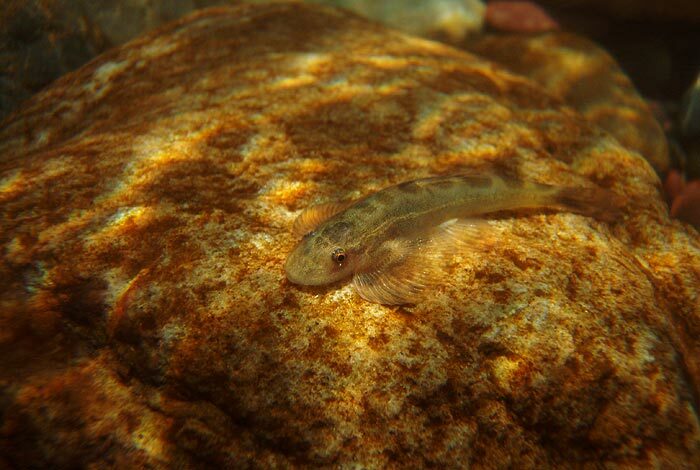 Known only from the upper Mae Nam Nan river basin, itself a tributary of the upper Chao Phraya system in Nan province, northern Thailand, making it the first member of the genus to be recorded outside China and Taiwan. Type locality is ‘Nam Wa River at Ban Nam Wa, Mae Nam Nan basin, Nan Province, northern Thailand’. 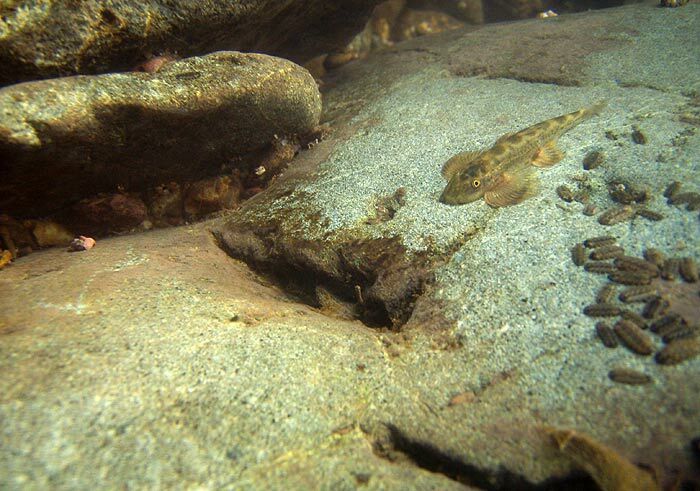 At the type locality it was collected in riffles of approximately 5-10 metres in width and around 20 cm in depth with substrates of algae-covered stones. 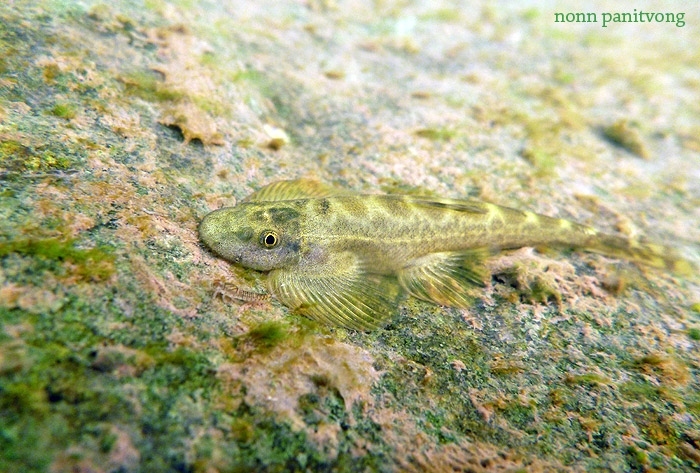 Sympatric fish species included Nemacheilus pallidus, Schistura menanensis, Homaloptera sp., Garra cambodgiensis, ‘Puntius‘ binotatus and Rhinogobius sp. 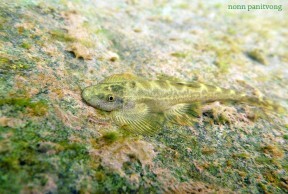 In the Nam Kon, another tributary of the Upper Mae Nam Nan, other fishes included Schistura menanensis, Rasbora paviei, ‘Puntius‘ jacobusboehlkei, Mystacoleucus marginatus, Barilius koratensis and Rhinogobius mekongianus. The largest specimen known measured 57 mm. An aquarium with base dimensions of at least 90 ∗ 30 cm or equivalent is recommended. This species may not yet have been exported for ornamental purposes although it was first mentioned in scientific literature by Kottelat and Chu (1988). It can be told apart from congeners by possession of the following combination of characters: 9-11 simple and 10-12 branched pectoral-fin rays; 3-4 (usually 3) simple and 8-9 (usually 9) branched pelvic-fin rays; 59-63 total lateral line scales; distance between pelvic-fin bases 8.1-9.6 % SL. Hemimyzon can be distinguished from most related genera since the pelvic fins do not form a sucking disc, although they may be fused at the posterior base. It’s most similar to Jinshaia but has an emarginate to slightly-forked caudal-fin vs. deeply-forked in Jinshaia. Kottelat (2012) also considers the family Gastromyzontidae valid and many former balitorids are now contained within that group, but Hemimyzon is retained in Balitoridae. 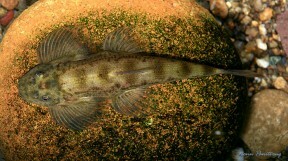 Hemimyzon nanensis, a new balitorid fish from the Chao Phraya basin, Thailand. Hemimyzon sheni, a new species of balitorid fish (Teleostei: Balitoridae) from Taiwan.